No one wants to suffer from allergies. And what better way then to stop allergies naturally. Have you ever heard of taking spirulina for allergies? Well if you haven’t then pay attention. 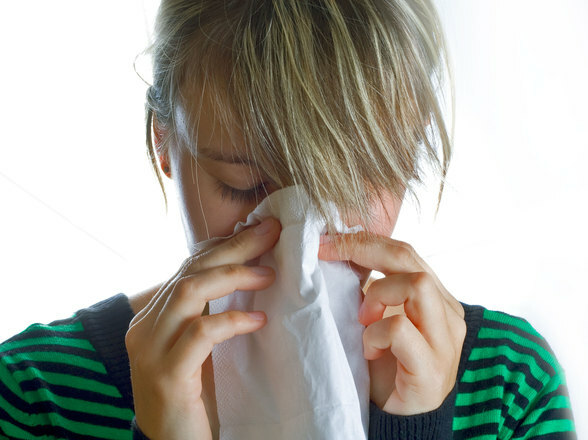 There are a lot of different reasons that you could be experiencing allergies. These reasons are mostly due to your immune systems response to the allergens, not the allergens themselves. One of the most common forms of allergies is that of Allergic rhinitis, which is an allergic reaction that happens when the immune system overreacts to breathing in substances (pollen, etc). Allergic rhinitis is common world wide and is not very well controlled. Some of the common symptoms that you may have if you suffer from Allergic rhinitis include stuffy or runny nose, sneezing, itchy or watery eyes, swollen eyelids, itchy throat/mouth/face, sore throat, headaches, and the list goes on. There are medications out there that control this allergic reaction, but having to take them continuously worries people due to potential side effects. So don’t bother with the synthetic medications anymore. This has been proven in several studies. One of which is available to view in the US National Library of MedicineNational Institutes of Health. In this study the subjects who supplemented spirulina for a period of time saw significant reduction in allergic reactions when compared to a placebo group. Nasal discharge, sneezing, nasal congestion and itching were all reduced during supplementation . The exact reason that spirulina prevents and helps stop the effects of Allergic rhinitis is unknown. But according to the University of Maryland Medical Center, spirulina inhibits histamine being released in the body . And histimine is known to lead to symptoms of Alergic rhinitis. Interleukin-6 is an immune protein that is the common cause of many immune system diseases. If your body’s Interleukin-6 production is out of wack, this throws off your immune system which in turn might be the cause of your allergies. Spirulina is shown to reduce Interleukin-6 production. This helps balance out the immune system allowing it to react how its supposed to. Antioxidants are extremely important for a healthy immune system. When your body’s immune system is actively fighting infection its phagocytic cells produce reactive oxygen. And this extra reactive oxygen going around can be harmful and damaging for a number of reasons. One of the most important being that it can damage the cell to cell communication which is necessary for proper immune system function. Spirulina has more than one antioxidant, but its most powerful is Phycocyanin. Besides being an antioxidant, Phycocyanin is also anti-inflammatory and neuroprotective. 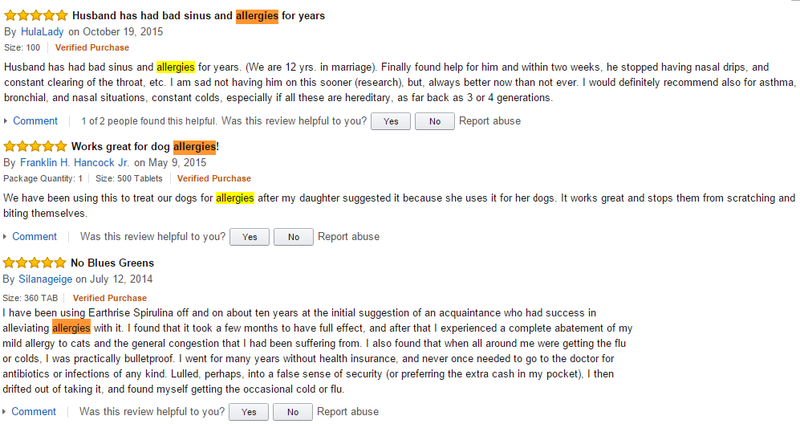 And as you can see, the second review is about how spirulina for dogs and how it helped with allergies. If you have seasonal or perennial allergies, or even food allergies and you haven’t tried spirulina then I suggest you do. Its not just your allergies that it will be helping with either. There are numerous other health benefits to supplementing spirulina, some of which can be found in the menu at the top of this page. If you are looking for quality spirulina that isn’t too expensive then check out these products that I have reviewed. 1) The effects of spirulina on allergic rhinitis. Eur Arch Otorhinolaryngol. 2008 Oct;265(10):1219-23. doi: 10.1007/s00405-008-0642-8. Epub 2008 Mar 15. 2) Allergic rhinitis. University of Maryland Medical Center. 2015 Aug.
NextSpirulina for HIV – Best natural treatment for HIV? I have suffered with allergies for years. I don’t normally like to take regular allergy medicine because they make me tired and dizzy. Had no idea spirulina was good for allergies, I will have to give it a try. Is it more potent if I take it in a certain way i.e. capsule, tablet, or powder? No, they would all be the same potency. But make sure you get a quality spirulina. Spirulina is not all grown equal, and this effects its nutrition. I am glad I read this because I either am stuffed up or my nose is running like crazy every single day of my life. I never knew that Spirulina would be an alternative to those medicines that never work. I will be sure to give it a try and let you know the results when I do. Awesome, I look forward to hearing your results. I hope it works well for you. Good product recommendation! I sometimes have random sneezing, must be an allergy to cold temperature. I’ll definitely add this to my list of medicine to try. Kyle, I have had allergies since we got a summer home in the woods, I hate taking the over the counter medication because it makes me loopy. I think I might have to look into Spirulina. Thanks! After reading this article, I am definitely considering Spirulina for Allergies. Do you know whether or not this can be prescribed by the doctor? My doctor currently prescribes me an allergy medication that I get for free thanks to great health insurance, but I am not sure I am willing to pay for Spirulina out of pocket just to see if it works. Also–do you know if this is something pregnant or breast feeding women can do to combat seasonal allergies? Thank you! It is safe during pregnancy and actually has many benefits. Just make sure you get your spirulina from a quality source. You can check out my top rated spirulina products here (which are as safe as they come). And as far as prescription spirulina, I don’t know for sure. You would have to check in your area. But I have heard of it before. Thank you sir. I’ll be putting out new content regularly. This is something new to me, maybe because I don’t suffer from allergies, My son has a problem with Air condition when he is in an Air Con room he starts to have a runny nose but when he is in a cold country for a holiday he is okay, is that some form of allergy? I am not exactly sure what that would be. But I don’t think thats an allergy. interesting article! I’m all about spirulina as a healthy food and nutritional supplement, but it helps with allergies too? Nice! Will you explain the science to me? How does this algae treat allergies? Do you need to keep taking this supplement for as long as you want relief, or is it cumulative? I recommend this site for anyone suffering from allergies. Check it out! You would have to continue to take spirulina for it to be beneficial. There are a number of reasons why spirulina is beneficial for stopping allergies. It reduces the body’s release of hystamine, reduces interleukin-6 production, and has powerful antioxidants such as Phycocyanin. Luckily I don’t suffer from allergic rhinitis myself but I’ve encountered it a lot over the years & it’s definitely good to know what we’re up against. Synthetic medications are quite a nightmare because of the side effects they tend to cause. So, if we have a chance to avoid these altogether that’s a big one. As I keep reading, I see Spirulina is something wonderful – incredibly high in protein, has essential amino acids, good source of antioxidants as well as vitamins & other nutrients. So basically what we’re looking at is dietary supplement? I see a lot of people get confused if they want to know what Spirulina actually is or what is it made out of. Well, it’s algae that grows naturally in warm fresh water bodies around the world right? Or did I miss something? Thank you for your effort & thanks for sharing with us this super food. Good luck & stay healthy! You are correct. Spirulina is an algae that grows in fresh water. But it is known to grow in salt water lakes as well. A lot of people tend to think that spirulina is all hype but it is actually a great dietary supplement as you said. This is a new one for me. Spirulina for allergies. I actually do use it, but as a meal replacement and protein content. Glad you put the reference in, so now I can check out the science behind it. It’s important for me to know the research behind claims. Anyway, maybe that’s the reason, I rarely suffer from seasonal allergies. I have known about the wonderful benefits of spirulina but I never knew it can help with allergies especially Allergic rhinitis! This is definitely great news and I am happy that the spirulina supplements I have been taking is actually an immune booster. Other than this sort of allergy, does it help any others? Thanks for sharing this!